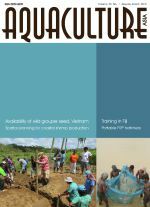 Peter Edwards writes on rural aquaculture: Aquaculture for Poverty Alleviation and Food Security - Part II. The role of rural extension in the sustainable development of Chinese aquaculture. Farmers as Scientists: Diversity enhances profitability and sustainability. Seed Production of Mud Crab Scylla spp. Genes and Fish: The dilemmas of strain selection. Seed Production of the Crucifix Crab Charybdis feriatus. 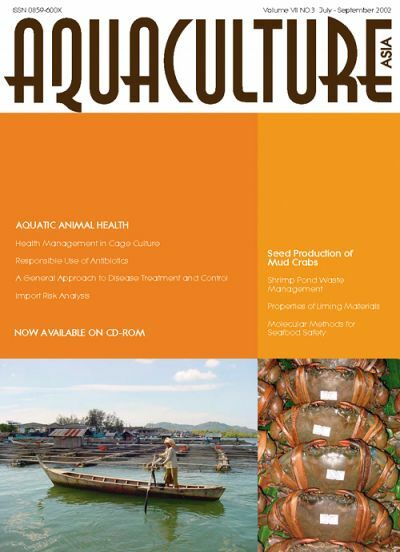 Aquaculture Fundamentals: A general approach to disease treatment & control. Marine Finfish Aquaculture Network meets in Vietnam. New APEC Project: Improving Coastal Livelihoods Through Sustainable Aquaculture Practices. Breeding and Seed Production of the Mangrove Red Snapper. APEC, FAO, NACA, and OIE enhance Capacity on Risk Analysis (IRA) in Aquatic Animal Movement in Asia-Pacific region. Advice on Aquatic Animal Health: Questions & answers on drugs and chemicals. Responsible use of antibiotics in shrimp farming. Practical approaches to health management for cage cultured marine fishes.